This is my wife, Betty Neale Counts family cemetery. "This cemetery is located in Union Twp., Vanderburgh Co., Indiana. It is on the Old Henderson Rd. 3.3 miles south of Deusner Road. It is next to a red barn and is enclosed in a small concrete wall. Most of the stones were buried and very difficult to locate. The entire cemetery was overgrown by a wide-blade grass that had died and fallen over and covered the stones. Copied Nov. 13, 1983 by Andrew J. Fehd, Bonnie S. Fehd, Scott W. Fehd, Glenda K. Trapp and John G. West." 1. Lantaff, Carol A. and Trapp, Glenda K. Cemetery Records of Vanderburgh County, Indiana Volume 2. Owensboro, Ky.: Cook-McDowell Publications, 1986. 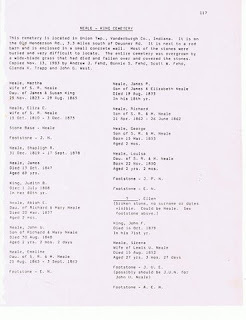 Published and Copyrighted by the Tri-State Genealogical Society. 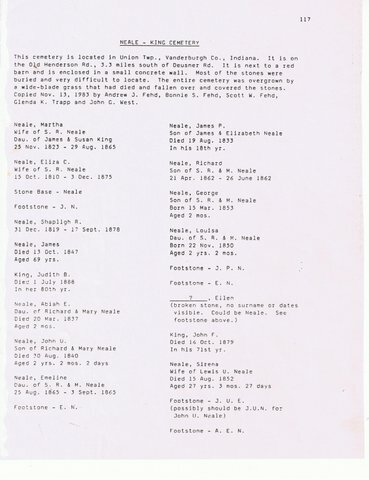 The information contained in this publication is prohibited for any use without the explicit written permission of the Tri-State Genealogical Society.